Six projects from the public sector – from artwork in a hospital to a new primary school – reveal an abundance of innovation at work. The similarities between caring for patients in hospitals and nurturing plants in conservatories are explored in Le Jardin hospitalier, a 100m-long installation in a hospital corridor by London-based artist Jyll Bradley. The artwork enlivens a dark corridor linking a new wing with the Seventies' Brutalist Hôpital Roger Salengro in Lille. When Bradley was commissioned to create an installation there by Les Nouveaux Commanditaires she travelled to Lille, explored the city's unsung historic role in the development of botanical medicine and researched what echoes of this might remain today. 'There's a parallel universe between looking after plants under glass and looking after patients in hospital,' says Bradley. 'You need the same things for both -- light, water, food,' adding that the patients and plants share a sense of dependency. For her installation, she took 5in x 4in analogue photographs of plants under glass and installed 12 of the images as floor-to-ceiling LED light boxes/tiles along the corridor. Themselves filled with light, these luminous images become a light source as well as an artwork, and appear as windows that you could imagine stepping through into the plant-house environment. These back-lit images are deliberately not idealised -- with muddy soil and the plants' life support of pipes, tubes and thermometers shown as well as the plants themselves -- as Bradley says, the hospital patients are themselves hardly in an idealised state. Photography by Thierry Bal. Le Jardin Hospitalier, 2015 by Jyll Bradley as part of the new Patrons Programme, Fondation De France / Curated And Produced By Artconnexion, Lille. The promenade of images are combined with douglas fir veneer wall cladding the length of the corridor, with integral handrail and lighting. To contrast with the representational images, Bradley has also included a number of large-scale abstract panels using stripy backlit vinyl overlaid with luminous edge-lit acrylic glass. 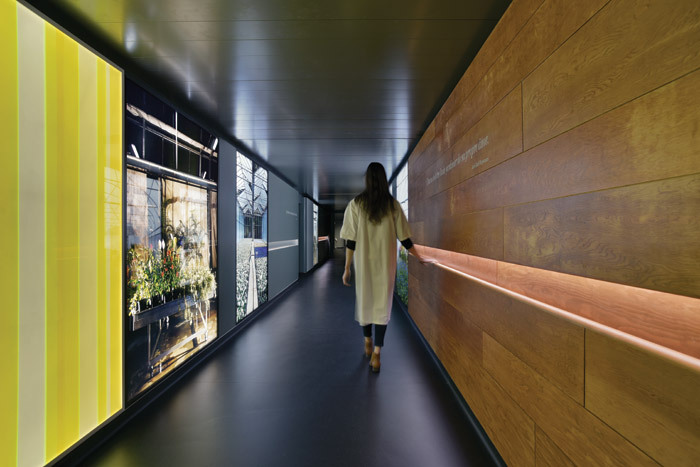 'It's a real journey and a completely different atmosphere to everywhere else in the hospital,' she says, adding that it was important that the installation created a sense of place that reflected its location in Lille. The installation was produced and curated by artconnexion in Lille as part of the Fondation de France's New Patrons Programme. Bradley's work is frequently concerned with light and its impact on plants. Previous installations include Green/Light (For M.R.) at the 2014 Folkestone Triennial. Like many modernist school buildings, ARK Putney (previously the Elliott School) presented challenges for making it suitable for contemporary learning. Built in 1956, the Grade II listed school building suffered from dilapidated cladding, poor temperature control, and classrooms and sports provision of unsuitable sizes. Wandsworth Borough Council was initially divided on the best course of action to take. Should it go for a full refurbishment that could cost £40m-50m, or seek to have the building delisted and replaced with a new build costing a more modest £25m? In the end, a third way was found by Hawkins\Brown working with Lend Lease, ARK Schools and the council. Reduced pupil numbers meant that surplus playing fields could be sold off to bring in additional funding. Meanwhile careful analysis of the existing building identified suitable areas for selective demolition and new build as well as widespread modernisation. The resulting £18m project achieved the refurbishment necessary while retaining the distinctive character of the original building. 'Strategically, we've got a good result, managing to marry these opposing solutions and come up with something that everyone would welcome,' says Hawkins\ Brown co-founder Roger Hawkins, adding that there were some 'fantastic' spaces in the original building. 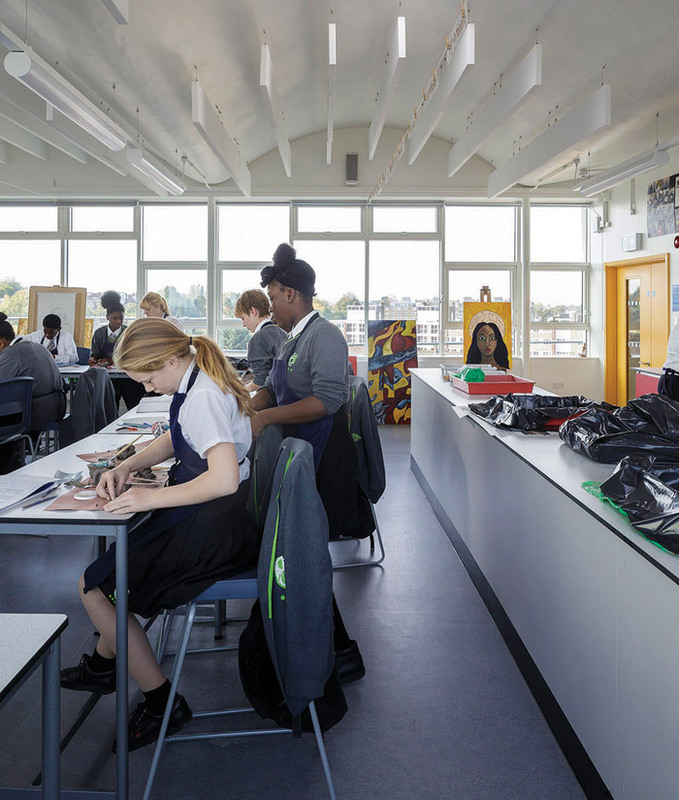 This 'common sense' overhaul resulted in an upgraded school that exceeded the space-provision standards that would have been achieved if a new-build scenario had gone ahead. Instead, the refurbishment included replacing the failing, single-glazed curtain walling and replacing it with a double-glazed system faithful to the original grid while meeting contemporary thermal standards. 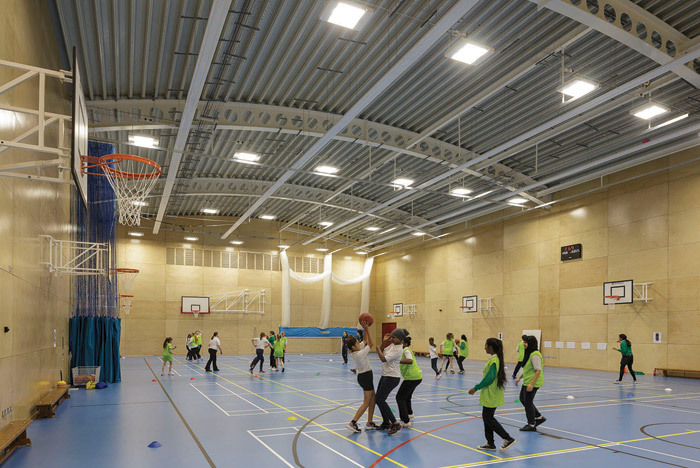 High-quality spaces such as the top-floor art department, with its scalloped roof, and the generous main hall have been retained, while a number of poor-quality additions were demolished as well as the original sports hall. This was replaced with a brick-clad new building linked by a canopy to the old building and positioned to allow community use out-of-school hours. 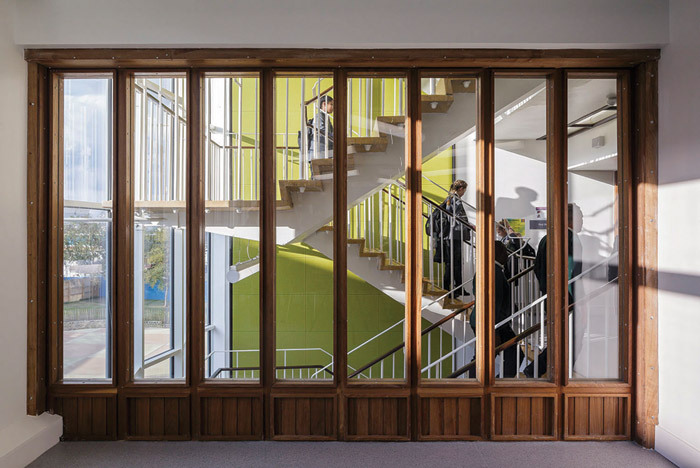 'It's a real mix of new and old together with no real tidemark between the two,' says Hawkins, adding that the project is a case study for what can be achieved through the retention and careful upgrade of listed and high quality, non-listed school buildings.